You know what’s not fun about this winter? Colds, that’s what. I hate the feeling. Everything in my head feels stuffy, blocked off, and heavy. Today is not a good day for me personally, and as a whole I don’t usually look forward to the winter months of the year. But there is one good thing to look forward to that everyone can appreciate, blocked sinuses or not – new graphics cards! AMD has two more GPUs coming up in the next month or so, and they promise to be every bit as disruptive as the Radeon RX 480. The Polaris family is made up of two lines – Polaris 11 and Polaris 10. The codenames of AMD’s current and upcoming new GPUs are references to various stars that currently, and in the future, will be considered as the “North Star”. Polaris, for now, is called the North Star, a guiding point to tell us which direction true north is, at least if you’re in the northern hemisphere (anyone below the equator can use the Southern Cross and its pointer stars to determine direction). AMD’s next architecture, Vega, is named after the star known as Vega, which was the North Star around 12,000 BC, and will eventually become the North Star again around 13,700 AD. Thankfully, we’re not going to have to wait eleven thousand years for AMD to release Vega, which is expected to drop either late 2016, or early 2017. 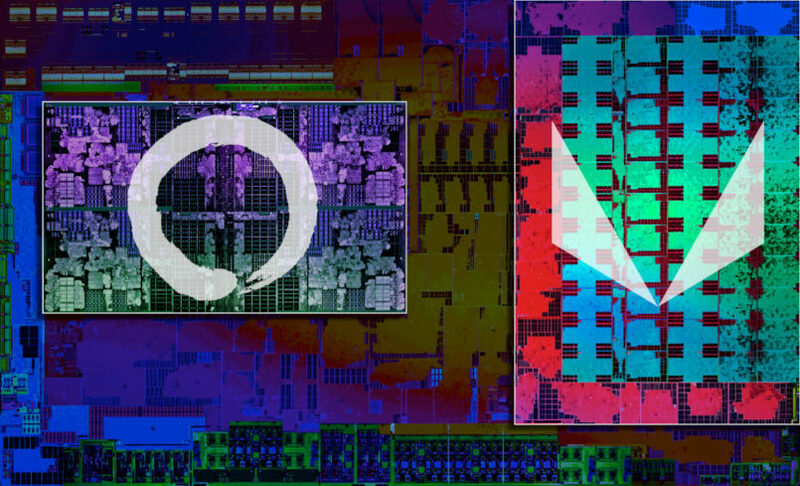 AMD’s third announced architecture, Navi, doesn’t have any special space relations. It’s not a star, which is a bit weird. Anyway, AMD chose these names for a particular reason – the products that borrow these names, Polaris and Vega, are thought to be guiding points for AMD and the graphics card chip industry. Polaris points AMD to where they want to go, and gives them direction when the path ahead doesn’t seem clear. Vega is the next step, guiding them in the right direction for their high-end GPU lineups. It’s a bit clunky when saying it out loud, but it makes sense somehow. 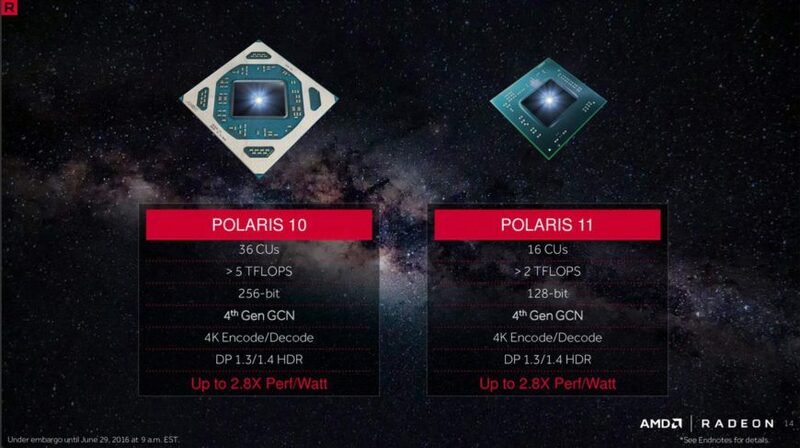 Polaris 11 was also AMD’s focus when starting out on their GPU revamp, while Polaris 10 uses the lessons learned from building Polaris 11 and previous GCN designs. Taking an overall view of AMD’s offering, Polaris 10 is their mid-range offering. It maxes out at 36 Compute units, or 2304 stream processors, has more than 5TFLOPS of single-precision throughput in its final form, which is the RX 480, and features a 256-bit memory bus. Those specifications are quite clear, and this means that we can’t reasonably expect anything crazy, like a 40CU 384-bit Polaris 10 hybrid popping out of nowhere. It’s not in AMD’s best interests, or their partner’s, to design such a GPU. Polaris 11 is what will revamp the baseline, and this covers everything from the currently shipping Radeon R7 360 to the Radeon R5 230. 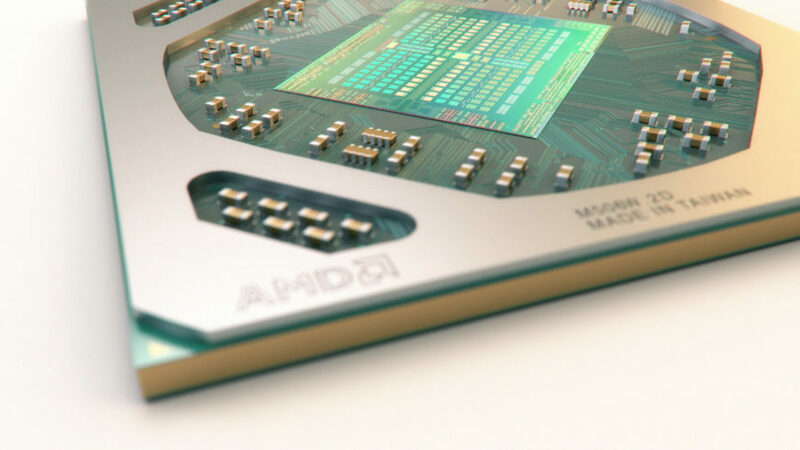 It seems that AMD’s plan is to get out of the super low-end graphics market, where the current offerings feature DDR3 memory and 64-bit memory buses, sticking instead to 128-bit bus widths and cheap GDDR5. 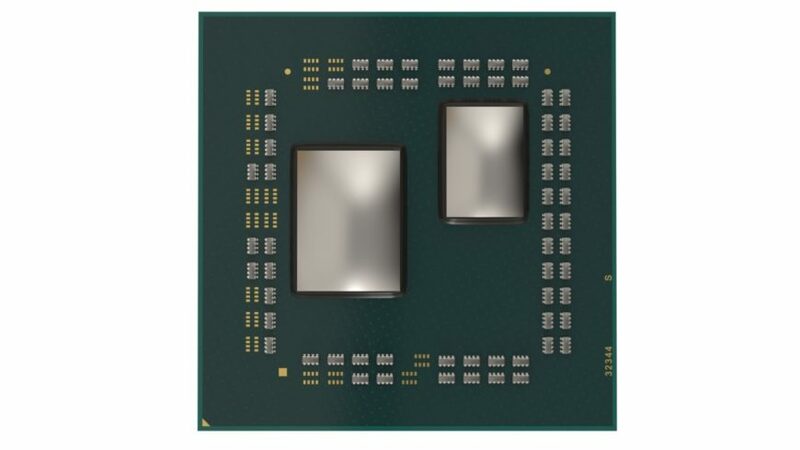 The top-end chip will feature 16 CUs and have more than 2TFLOPS of single-precision throughput, which means it’ll be a faster Radeon R7 370 with a smaller memory bus and no 6-pin auxiliary power input. The R7 370 has a thermal design power (TDP) of 110W, so it’s reasonable to assume that it’s replacement will require less than 70W of power through the PCI-Express slot. So here we have the second Polaris 10 chip, the Radeon RX 470. 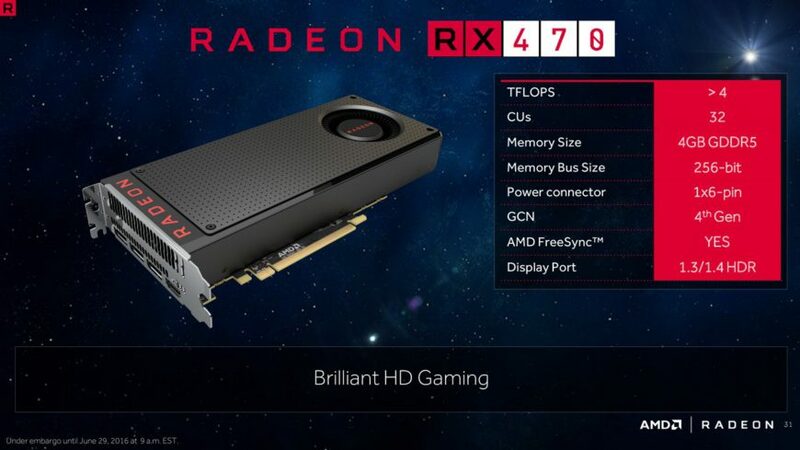 It’s a cut-down RX 480 GPU, so that means we’re probably going to see versions of this card with 4GB and 8GB of RAM. It’s expected to be priced around $149, which makes it an in-place upgrade from the Radeon R370. However, with double the shader resources and starting VRAM, it’s going to be at least twice as powerful, if not more when you overclock it. It’s not known where this card will sit relative to the RX 480 in terms of performance, however. If it’s even 15% slower than the Polaris 10 flagship, that’s still more than 20% faster than the R9 380X, a card that currently sells for $210. 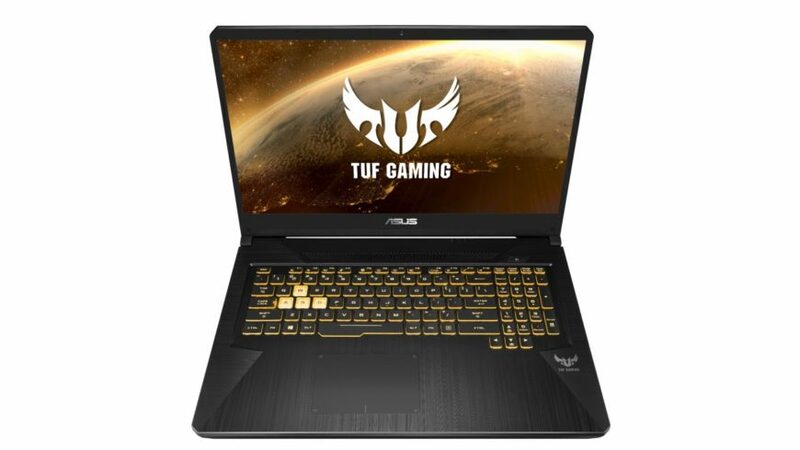 Coupled with the power savings, and possibly an 8GB version priced at $179, this will be a massive pain in the neck for NVIDIA, because it steals the attention away from the GeForce GTX 950 2GB models, priced currently at around $140. It’s a really aggressive play, and I’m pretty excited to see how AMD markets this one. The Radeon RX 460 is also an interesting card, which could end up selling for $100. Sporting 14 CUs and thus 896 stream processors, it’s a direct replacement for the Radeon R7 360, which had a similar number of CUs, the same amount of memory, and the same bus width. This card doesn’t ship with a 6-pin power connector, so it’s targeting well below a 75W power draw, and will also serve as the basis for a lot of mobile designs that will pop up in notebooks. The interesting but about this card is that it will probably have more than 2TFLOPS of throughput, which places it in front of the Radeon R7 370 on paper, but it won’t deliver twice the performance of the R7 360. Will that matter in the long run? Probably not, but it’s as good an indication as any of how efficient AMD’s new architecture really is. Despite having 128 more stream processors than the R7 360, and having an extra 400-700 GFLOPS of estimated power, it will probably only deliver 50% more performance if higher clock speeds are thrown in. 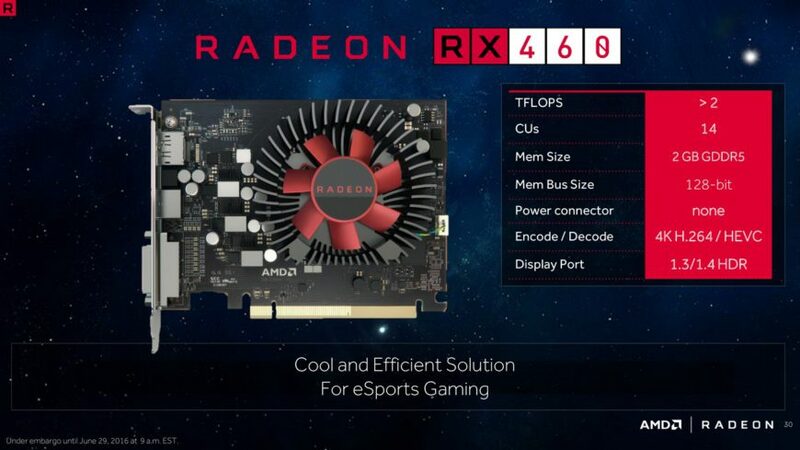 However, if you think about the RX 460 in relation to the R7 250X, which is still in production, then things begin to make sense – AMD intends on replacing two products with the RX 460, and it’ll be faster and cheaper than both. We might even see a doubling on performance over the R7 250X here, which would be fantastic. Those of you paying enough attention might also notice that the PCI-E slot in the rendered image isn’t using the full sixteen lanes allocated to it. I think this is only a PCI-E 3.0 8x card when all is said and done, pointing again at its roots as a mobile design first, and a desktop-class GPU second. It might not even support XDMA multi-GPU setups, something that AMD has disabled on cheaper cards in the past. Lets recap quickly with some of the things you can look forward to by getting one of these cards. If you’re thinking about upgrading your monitor, either one of these cards we’re discussing today, which also extends to the Radeon RX 480 launched this week, will work with monitors supporting Displayport 1.3 and HDMI 2.0. That enables resolutions up to UltraHD 5K at 60Hz, or UHD 4K at 120Hz, and crazy-high 240FPS 1080p monitors (I don’t even think those panels exist yet). FreeSync support is also thrown in, and there are more than two dozen FreeSync displays on the market right now. As a quick refresher, FreeSync is AMD’s name for their implementation in hardware and software of the Displayport Adaptive Sync standard, which allows the GPU to dictate the monitor’s refresh rate, so that the frame rate is always matched to the refresh rate, eliminating tearing and reducing judder and stutter in animations that take place in between the LCD refresh intervals. 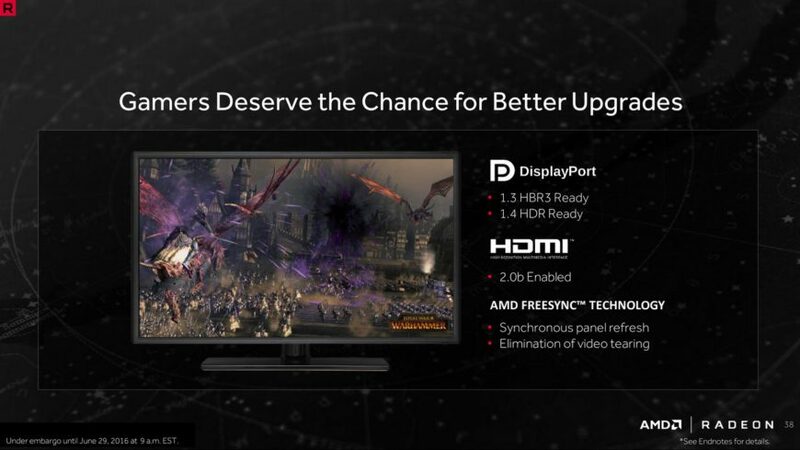 HDMI FreeSync support is a very recent addition that is currently only supported on two or three cards in AMD’s stable, and it’s not widely available yet. In a nutshell, GPUOpen is AMD’s version of the collection of tools and code that forms NVIDIA’s Gameworks API suite. The difference here, however, is that GPUOpen is an open, free standard that includes a lot of tools and methods of doing rendering on a GPU that is openly available to anyone who wants to look deeper into it. 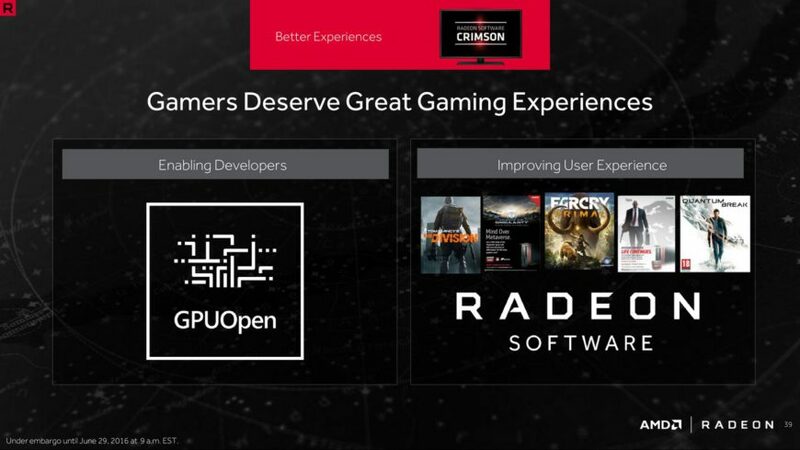 Most of the software is distributed with an open-source license, and AMD promises to never hide any part of GPUOpen’s code behind a paywall or a non-disclosure agreement. Basically everything written and discussed on the GPUOpen pages also applies for NVIDIA graphics cards, aside from workloads that are obviously not as efficient to run on NVIDIA’s architectures. Radeon Software is AMD’s new set of drivers, which have seen a tremendous re-work in order to be more user friendly and scalable for a better user experience. 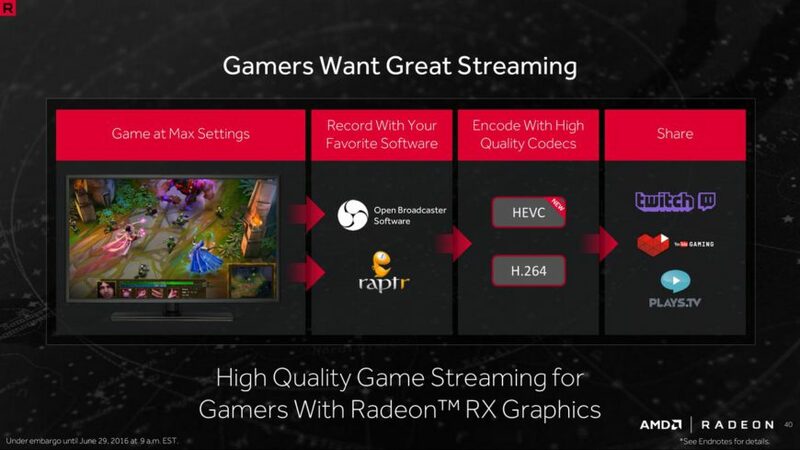 AMD’s Radeon Technologies Group (RTG) subdivision has also been very aggressive with driver releases, pushing out game-ready drivers as soon as possible for big launches, and providing up to six WHQL-certified drivers a year for systems integrators who prefer using the stable channel instead of beta drivers. The end result is that AMD is as on-the-ball as NVIDIA’s driver team in some cases, though the lack of manpower is evident in the number of fixes and games they’re able to cover with their updates. Speaking of drivers, included in the drivers for the RX 400 series is AMD’s new overclocking interface, called Radeon Wattman (Watt Manager, not a pun on Mark Watney’s name from The Martian). This is a replacement for AMD’s Overdrive interface for older cards, but it won’t ever come to the older cards thanks to hardware changes in the Polaris 10 and 11 chips that make this possible. In a similar vein to NVIDIA’s partner software that can do per-state clock adjustments, Wattman takes it one step further and allows you to tune the voltage curve of the card as well as play around with fan speeds, base and boost clock limits, and try get more performance out of your system. It’s a more involved interface, for sure, and it’s not going to be intuitive for everyone on their first try, but it is way more control than AMD has ever given users in the past. 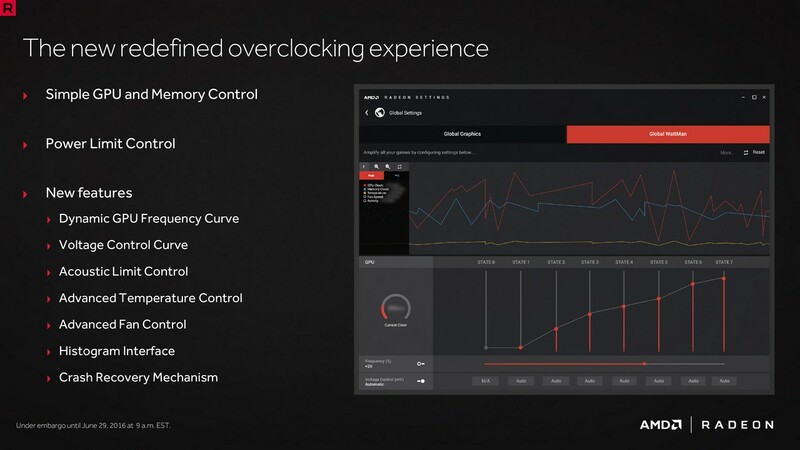 Expect to see even more robust and in-depth overclocking tools from AMD’s partners. For those of you who stream or record their gameplay, there’s also the latest-generation support for the H.265 HEVC encode and decode through dedicated hardware, which delivers a much more detailed and cleaner image that also uses less bandwidth. AMD’s Raptr partnership continues with their Gaming Evolved client, but I think more people will prefer using OBS instead. 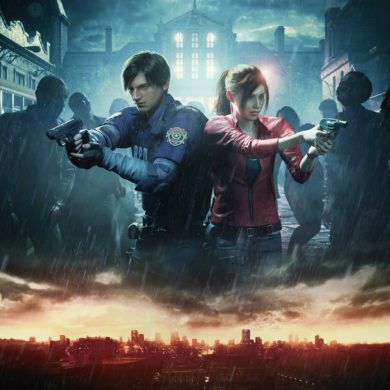 At the same time, support for these standards also means that game streaming through something like Steam In-Home Streaming becomes more reliable, and will give you a better-looking image. If you use your PC to watch media, there’s also support for those UltraHD 4K Blu-Ray discs which require HEVC decode hardware for smooth playback, as well as HDCP 2.2 to enable playback for stuff like Netflix and HBO Go. HDR is also supported, but monitors are a long way away from general availability locally.